Why choose a luxury train journey? British Pullman or Northern Belle? Lunch, dinner, or afternoon tea? Step into your Sunday best and climb aboard either the Belmond British Pullman or Belmond Northern Belle luxury train for gleaming carriages and a taste of glamour in this golden age experience. Find out for yourself how the other half lived in 18th and 19th century Britain, and experience first-class travel in vintage carriages complete with five-star service and sumptuous cuisine. Journey through rolling countryside in the lap of luxury to visit some of Britain's greatest destinations and most famous landmarks. Enjoy the ride of your life in this wonderful experience which is just the ticket for anyone who loves vintage voyages. Belmond is a brand synonymous with luxury, and it maintains the British Pullman and Northern Belle to impeccable standards. Stepping aboard either train is both a case of stepping back in time and stepping into luxurious surroundings. This isn't your typical British rail service. No weak tea, cramped seats, overcrowded carriages, and excessive delays here. Instead, this is refined British service at its best. Greeted with a smile, you'll be treated like your lord or lady alter ego. Bottles of fizz, fine teas, and exquisite meals top this service off perfectly. This is a day trip with a difference. A trip back in time to see how glamorous the golden age of travel really was. The Belmond British Pullman, named to honour the father of luxury train travel, George Mortimer Pullman, is the sister train to the famous Venice Simplon-Orient-Express. It pulls vintage carriages that once ran on the 1920s services including The Brighton Belle and The Golden Arrow. Each carriage is uniquely named and carefully restored to the splendid decorations of the 1920's and 1930's. The oldest carriage dates back to 1925. Some survived bomb damage during the 1940's air-raids. Each has a story to tell. Belmond Northern Belle entered service in 2000 and reflects the style of England's 'Belle' trains. It too features carefully restored and individually decorated carriages. Whichever train you choose, expect impeccable service and attention to detail. This is one rail journey you will never forget. The afternoon tea events are ideal for a taste of the golden age of travel combined with that quintessential British tradition, afternoon tea. Sip on a glass of Champagne on arrival, and enjoy a selection of dainty sandwiches and cakes with tea and coffee to a backdrop of strolling musicians and table magicians. Themed variations of the afternoon tea trip are also available, most notably the Mad Hatter's Afternoon Tea Party which is a tribute to Lewis Carroll's Alice in Wonderland tale. Enjoy this afternoon tea experience with a twist. Expect surprises, including purple sandwiches. Whether you choose lunch or dinner, you will be in for a treat. Chefs use the finest seasonal ingredients to create classic and innovative dishes in what is essentially a cupboard-sized kitchen. Sample menus contain deliciously tempting dishes such as Guinea Fowl and Sunblushed Tomato Terrine and Slow Cooked Pork Cheek with Black Pudding Potato Cake. 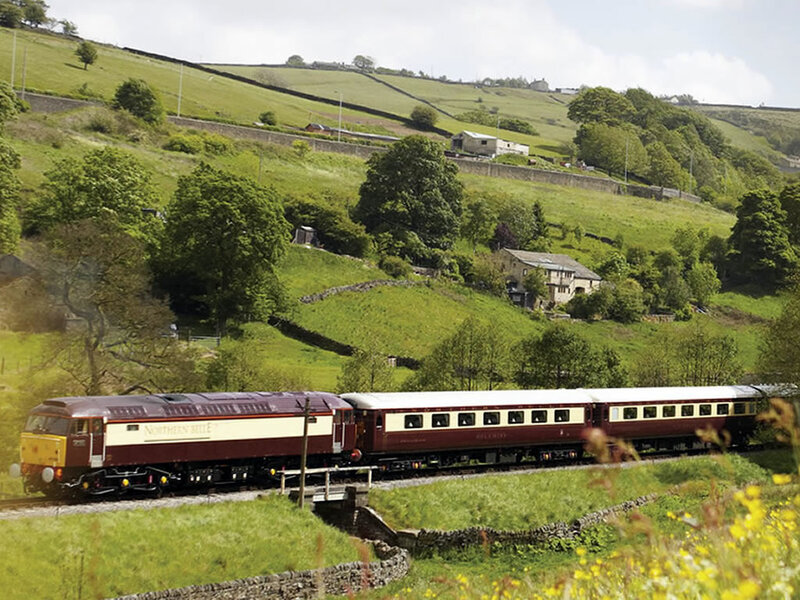 WHEN: Journeys on Belmond British Pullman or Belmond Northern Belle take place throughout the year. Trains follow a timetable taking them to a range of departure points and destinations. WHERE: Trains depart from stations nationwide based on a timetable. Bear in mind these two trains travel the country, so you may need to wait until they are scheduled to return to a train station near you, or you may need to travel further to reach a departure station. WHO: This gift idea is ideal for anyone with a fondness of how things used to be, so a parent or grandparent for example. It is also ideal for someone who is too young to remember the golden age of travel but would love to sample life back then in luxury, style, and comfort. OCCASIONS: This is an excellent idea for a birthday or Christmas present. It also makes a wonderful gift for a landmark anniversary as it is an excuse for the happy couple to dress up and enjoy the luxury lifestyle onboard a beautifully restored train. There are a number of ways to enjoy this fantastic experience from Belmond. Luxury train afternoon tea experiences, exquisite lunch and dinner train travel, or nostalgic day trips make for wonderful gifts for parents and grandparents for birthdays, Christmas, and anniversaries. If you are searching for a gift idea that will hit the spot, look no further. While there are many varieties of day trip and themed train events, these are my personal favourites. Enjoy either a traditional afternoon experience or quirky Mad Hatter's Afternoon Tea Party with this voucher (personally I'd opt for the latter but I like things like that). Belmond Northern Belle will be your luxury steed for the trip as you relive the glamour of 1930's rail travel. This is what a Belmond train journey is all about - a beautiful steam train chugging its way through beautiful English countryside. Step aboard Belmond British Pullman for this incredible once-in-a-lifetime journey in a vintage restored carriage. Enjoy a sumptuous five course lunch on the five-hour return journey from London Victoria. For something a bit different, book a murder mystery journey on Belmond British Pullman. You'll meet some suspicious characters and will try to solve a murder mystery during a round trip from London Victoria. You'll also enjoy a Champagne lunch onboard too. It is worth noting that Belmond experience day vouchers now only cover trips up to the value of the voucher. You may therefore need to pay an additional supplement to book popular or short notice events. Alternatively, book further ahead in advance where prices will usually be lower.